LOTE Auslan Activity Book B – Intermediate Level e-book is a jumbo activity book (over 330 pages) with plenty of Auslan activity sheets to choose from for your classroom. All its content, signs and pictures are taken from The Auslan Picture Dictionary e-book, making it easier for the teacher to locate the topics between the two books. 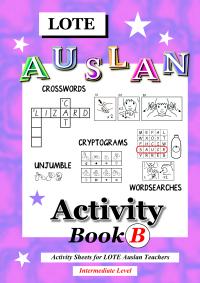 The activity sheets in the LOTE Auslan Activity Book B e-book is suitable for Grade 3 to 6 students. Teachers can use their judgement to use activity sheets from LOTE Auslan Activity Book A – Beginner Level if there are students who are new or struggling with Auslan in their classroom (especially the wordsearch puzzles, as LOTE Auslan Activity Book A – Beginner Level e-book has clues). Cut and Paste, Labelling, Wordsearch (without clues), Crossword, Decoding Fingerspelling, Translating and Test. The signs in the e-book are from the Victorian state, signs all around Australia are generally the same except for a few, especially colours. If you are from a state other than Victoria, please double check the signs that they are the same that your state use. There is a free Auslan Picture Dictionary Video where you can check how the signs are being signed out (the video uses Victorian signs). Once payment has been made, an email will be sent to you in 1 to 3 business days with the e-book attached or a Drop Box link where you can download the e-book. The LOTE Auslan Activity Book B e-book is copyright and for personal and school classroom use only. The e-book is to be printed only once its entirety per individual/teacher and the individual/teacher may photocopy the e-book as many times for personal and classroom use. Please do not photocopy or reprint the e-book to be distributed to other individuals or teachers, please direct them to this website instead. For Individual Auslan Teachers and/or Companies - if you would like to use e-books from Auslan Resources as part of your Auslan teaching business, for example, teaching private Auslan classes or community Auslan classes, please contact me for permission and special deal discounts.